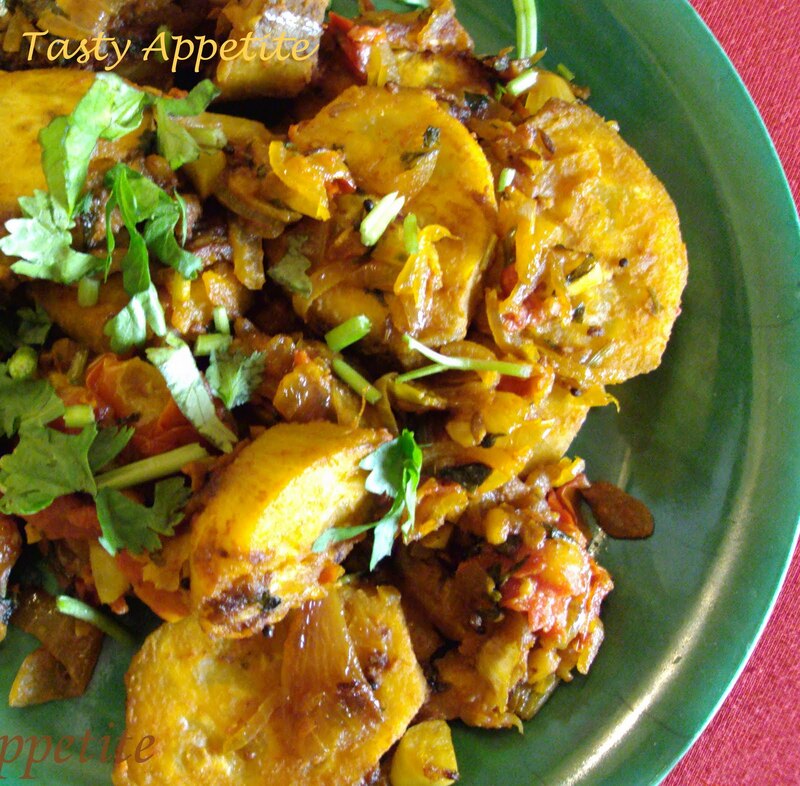 Today’s recipe is a spicy masala stir fry dish using Raw Plantain ( Green ). This is a popular vegetable in Southern states of Tamil Nadu, Kerala & serves as a major source of starchy calories. This fry recipe is quickest and easiest to prepare. I like to savour this dish in my Mom’s taste. 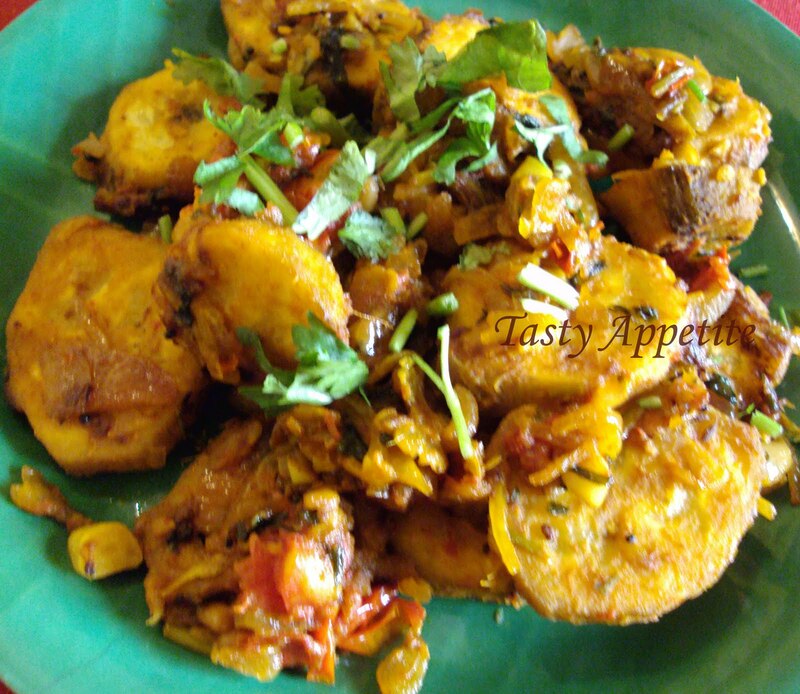 Here you go with the simple Plantain Fry recipe, which tastes excellent with variety rice..!!! Try them once and you’ll be hooked..
1. Wash and peel the skin of plantain. 2. Finely slice to small pieces. 4. Add mustard, cumin, hing and curry leaves. 6. Add chopped onion and garlic pieces. 7. Sauté till it is soft. 8. Add mashed tomato and cook well. 9. Add turmeric pwd, red chilly pwd, pepper pwd and combine. 10. Now add plantain pieces, mix with little water. 11. Cover and cook , until plantain is cooked soft. 12. Drizzle oil to sides and fry in low flame. 13. 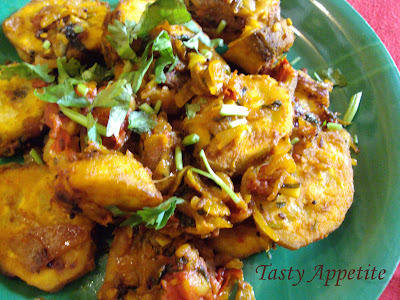 Remove from flame, add a tsp of lemon juice, chopped coriander leaves and stir. 14. Serve hot with rice along with sambar / rasam. Nice recipe, Jay..Raw banana fry looks very yummy! Tasty sounding recipe! I've only ever had plantains as a sweet dish, not savory. So this should be fun! 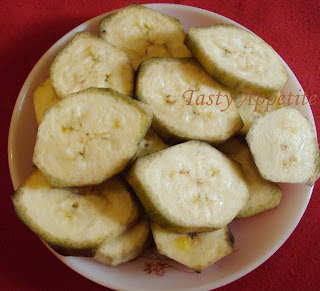 a few minutes ago i just google what is plaintains.. i thought it was same like bananas.. only i know plaintains is not sweet.. but starchy.. never found plaintains in Malaysia yet.. just wonder.. how it's taste..
How to miss this recipe, its such a favorite among the Indian family, great with sambar. Nice dish...I often make this with dal chawal.. Wow!! I never tried this method. It looks easy too. Will try this soon. OMG.. This is the one i m looking for.. Thx for sharing..
Never had this before but it's worth trying. Great flavour. Jay...this looks very tempting....I have never made stir fry with so many spices...will try it sometime..
Wow...Jay this is really a very yummy fry with all masalas...you are tempting me very much...not fair :) so this is my next raw banana recipe...super like!!! ahh i used to eat fried plaintains when i was living in peru for a bit! they are such a delight! Browsing here and there, I came across your Blog ... And it was a pleasant surprise! I have to congratulate you for the quality of the recipes that you propose, photos and all the contents of this interesting your space. Oh my gosh this looks SO GOOD! I really love plantains but have never used them in dishes! We are your newest followers!! Looks yummy and different with tomato. we won't use tomato for this recipe. will give a try next time. Yummy fry..Love to have with rasam sadam. I really enjoy your comments and suggestions and look forward to them. Nice one Jay!!!! I love raw banan subzis!! We love this anytime and I make a slightly different version. Next time I'll try adding hing, tomato and pepper powder for a delicious twist--thanks to you! Plantains were my fav.when I went to college in Florida...I miss them. Yours look so flavorful! Lovely recipe! I am sure my family will love it! Thanks for sharing dear! One of my favourite "uperi" - thats what we call this preparation in Kerala. I love bananas, so I will have to try this! Fry looks delicious, very tempting color. Delicious banana fry,looks so tempting. Can't wait to try this one! We order plantains at a local restaurant here so I am eager to make my own. I have never seen hing available here in the US, would it make a big difference if I had to omit it?